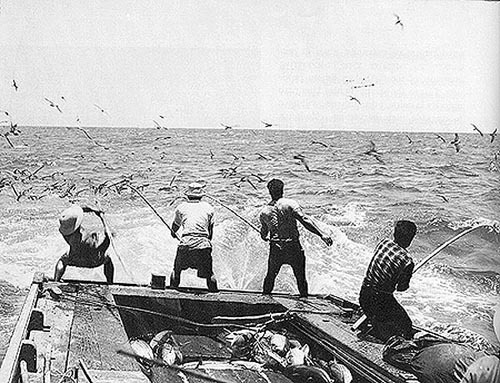 I had the privilege of working as a fisherman on “Tradewind” on the early part of 80’s. Under Captain Grace I had the most unforgettable adventures on this traditional “old school” Japanese sampan or “Aku boat”, as the local people called them. Starting from the Kewalo Basin very early hours of the morning, we would first head around Diamondhead, destination Kaneohe Bay, where we would arrive still early hours of the morning and lay nets for the bait fish. Then head straight out to sea, while both the Captain and the First Mate of the vessel would scan the horizon for seabirds to locate the large schools of tuna. As the boat slowly got closer and closer to the schools of Tuna, the First Mate would climb down from the high cockpit where Captain Grace continued to steer the vessel. The first mate would then open several valves around the sides of the vessel each creating a shower around the entire boat. The entire boat was under a beautiful shower of water reflecting rainbows everywhere. He would then open the tops of the deep containers where the living bait fish was swimming alive and fresh. With a small net he would then start throwing the live bait fish sparingly on both sides of the boat. During all this was happening, all the fishermen, myself included were getting ready for the main event. First putting a wide rubber belt around the waist with a “puka” (hole) in the front where the end of the long heavy bamboo pole would be placed. Barbless hook with some small feathers were carefully tied to the end of each fishing line as all the men finally, upon command, took their places in the very back of the boat, about 10 men right next to each other, lowering the barbless hook carefully right under the surface of the water. Birds were now surrounding the boat as all the men, under intense concentration while balancing themselves in rough seas with absolutely nothing to hold on to. They came from nowhere, HUGE tuna fish with incredible speed, all at once from the back of the boat. By the hundreds, with such force, size and speed that my instant first concern was how to survive alive if I would slip and fall overboard and be hit by the huge schools of the fast torpedoes. My fellow fisher man ( a much younger local teen) quickly calmed my concern by saying that falling overboard was not part of the game, then reminded me to be sure, once the huge monster tuna was on my hook to make sure not to allow the fish swing all over the place and mess up others fishing lines but to remember to bring it towards myself and swing it precisely between the fisherman on either side of me, then lower the the tuna on the bottom of the vessel behind , shade the bamboo pole this releasing the barbless hook from the beasts mouth and controllably swing the hook over me immediately back to water, as the frenzied action lasted only a limited time. It was the undoubtedly the hardest and the most exciting event that I had ever experienced. Now as I’m living the year 2013, none of these original Aku boats exist anymore, I am saddened to realize how important and treasured part of the Hawaiian culture and history this yet primitive but extremely effective fishing these boats represented. And what is even more astounding to me is the wonderful interest and excitement is shown by the even the youngest local youth, as I share my experience.